MoCo voters, Maryland primaries are starting next week. You’ve heard from us why every vote matters, and when we vote, we win! You know we’re focused on turnout. Now, for those of you who already have a plan to vote- take our challenge to vote every race, all the way down the ballot. Look at what Jealous plans for Maryland! Join us on a forum on upcoming tax reform, November 4, 2017. MoCo member Tim Chambers recently published a white paper with the progressive think tank NDN. If you are interested in understanding social media bots, and the threats they pose, this is a great source! From the NDN website: "To help those in the political arena better understand this new phenomenon, NDN is proud to release a new paper, "A Primer on Social Media Bots and Their Malicious Use in US Politics." Written by our long time collaborator Tim Chambers, this paper lays out in plain, simple English what bots are, how they are being used, and some ways we can together combat their impact in the days ahead. Especially as we approach the 2018 and 2020 elections, it is critical that we understand and counteract this threat now, or we will lose this new form of information war. We must develop more and better technological defenses. We must demand that our social networks build for the good of the countries they act in, not just for their own profits. And we must adopt laws and policies that protect our democracy while safeguarding social media’s enormous potential to enhance the democratic process. This compelling new paper offers some early thinking on how we may want to approach taking on the bots. Please let us know what you think of it, and feel free to share with others you think might be interested." Click here to view "A Practical Guide to Resisting the Trump De-Regulatory Agenda". A link to the guide is also available in our Helpful Resources section. This is a workshop with and for federal employees who are concerned about their rights as citizens and about their roles in the workplace under the new administration. Through discussions with experts and an interactive action planning session, attendees will 1) learn more about their rights as a private citizen and in the workplace, 2) strategize about ways to build solidarity in the workplace, and 3) build a local network across agencies. -Takoma Park Mobilization Education & Training Group. We know, we keep telling you to call your legislators, but you're the kind of person who hates making phone calls. Several of your friends in Indivisible MoCo are in the same boat. We're offering a short coaching session on how to make your weekly calls fun and easy, with tips on how to be effective in your calling. This 20-minute session will take place right after the regular monthly meeting on May 23. Plan to stay, meet others, and get energized for the upcoming weeks! We’re your neighbors. We are here to uphold the country’s laws and the Constitution. We serve US taxpayers and citizens. And that’s a problem for Donald Trump. Trump and his loyalists have declared war on America’s public servants. This affects all of us. In other countries, political leaders stack the deck in favor of their family, friends and cronies throughout government offices. In this country, public servants have long been insulated from political pressure by laws and policies. In return, public servants are constrained from using their positions to influence voters or elections. This system serves the public interest, and prevents misuse of power. But now it’s under fresh and daily assault. In addition to pressures on the job, civil servants are facing public and online harassment (Breitbart News is in the forefront of this, sharing hit lists of bureaucrats). So Indivisible groups around the area are providing tools, resources and workshops to help our friends in the public service continue to do their jobs with integrity. We were grateful for this article on the importance of civil service, in Foreign Policy Magazine which departed from the magazine’s usual subject area. We’re just going to quote from it and encourage readers who don’t work for government to please read the whole article, and think about the importance of showing your support for your neighbors in public service! “The United States civil service can be an enormous asset for presidential administrations regardless of party, and undermining it belies a misunderstanding of what public servants actually do. These good folks, the vast majority of whom do not live in Washington, get up in the morning to cut social security checks, maintain aircraft carriers, treat veterans, guard the border, find Osama bin Laden, and yes, work hard to protect the president and make his policies look good. Many of them earn less than they would in the private sector and are deeply committed to serving the American people. Any effort to undercut them is irrational on its face. . . Some of the area’s Indivisible groups, including Takoma Park Mobilization and Indivisible MoCo, have organized “know-your-rights” workshops for federal employees. For those who want more information, we are distributing this list of key resources. Given the particular attention to climate research and other scientific data, we’re also sharing the following resources from the Union of Concerned Scientists that are especially for researchers and scientists in government. Finally, we recommend the Project on Government Oversight as a resource for those who are concerned about behavior that seems to go beyond what’s legal and ethical. POGO is going to be hosting a series of webinars for those who want more information about whistleblower protections. Being a public servant and upholding our laws shouldn’t be an act of resistance! Donald Trump is calling us the swamp- he’s even threatening us in his latest fundraising video, claiming “there are people in our unelected bureaucracy trying to sabotage us.” Help keep us beat back swamp-politicians who would abuse their positions to undermine our integrity, independence, and ultimately our responsibility to all our taxpayers must be held to account. (The author is a federal employee). Congressman John Sarbanes (MD, 3rd) leads the Democracy Reform Task Force which is an effort in the House of Representatives to build a government that puts public interest ahead special interests. On April 27th, the Democracy Reform Task Force unveiled a new report that illustrates the numerous and unprecedented ways that the Trump Administration – after only 100 days in office – has tested the extreme limits of ethics laws and standards. Read more about SWAMPED: 100 Ways in 100 Days. How The Trump Administration Has Flooded The Swamp In Washington. On April 29th, join CONGRESSMAN JAMIE RASKIN for a Breakfast Reception & Rally at Bethesda-Chevy Chase High School from 8:30 - 10:00am. Then board buses for the PEOPLE'S CLIMATE MARCH! Town Hall Forum: Great Turnout! Huge Success! A huge shout-out to the many volunteers that made last night’s sold-out Town Hall event such a success! Many of you may not be aware that the Town Hall event was conceived very recently, during an impromptu meeting on February 12, 2017. Over the next two weeks the newly formed Maryland Coalition (a small group of grassroots community organizations), came together to plan, organize and execute the event. The number of volunteers, who stepped up and committed serious time and effort to the cause, is truly amazing. Meg Edson was the key liaison between I/MoCo volunteers and the overall Town Hall leadership team. Tim Chambers played a central role on the Town Hall Social Media team, helping set direction and maximize media coverage. Sean Oberle, Holly Seltzer, Bama Athreya, Jj Biel-Goebel, Kate Monzo, Kerstyn Bryce, Ann Lui, Patricia Lake, Melissa Clark, Kent Mason, Sarah Salomon, & Roy Sewall. PLEASE – it you were part of the effort and you are not listed above, let us know. We are so very grateful for everyone’s efforts and we want to acknowledge all who took part. We are making plans for another Town Hall event during the April recess, so I hope everyone that helped with last night’s event is “Fired up, Ready to go” again! And that many others will decide it’s time to take on a more active role and join the ranks of the volunteers. We need your help, plus it's a lot of fun! Join our 3rd In-Person Organizing Meeting, March 14th! 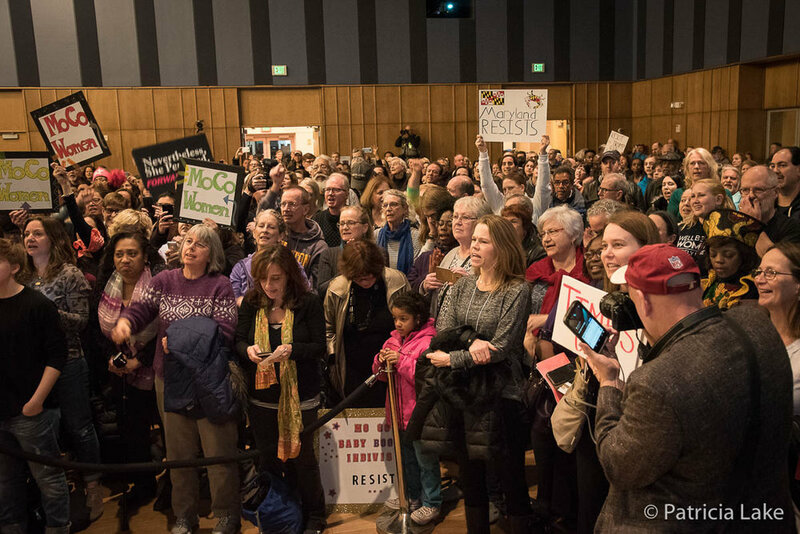 Come join in: Our third in-person Indivisible MoCo Meeting! March 14th at 7:30p EST, Bethesda Elementary School, 7600 Arlington Rd, Bethesda. And bring friends! Welcome to the brand new INDIVISIBLE MoCo Website... This is the very early days and we hope to evolve and grow the features of the site to best support our community here in Montgomery County. Thanks everyone!